CoasterRadio.com - Theme Park Blog and Podcast: EB Reviews (and rides) Holiday World's Wildebeest! EB Reviews (and rides) Holiday World's Wildebeest! I was thrilled to see the invite to come to Holiday World's Media Day for Wildebeest show up in my InBox last week. So of course I didn't pass up on the chance to visit my new home park (for free, natch). And despite my ultra-doubting and lack of enthusiasm for the Wildebeest, I was pleasantly surprised by my visit and my ride. EB: Where are we and what's happening today? Will: We're standing on the loading platform for Wildebeest. Take the idea of a roller coaster, take it out of the dry park and put it into the water park. Instead of riding in a big train, you have a four-person inner-tube. And you literally start at ground level - there's no stairs to climb - you ride up a big inclined conveyor, and then you go up and down hills just like in a regular roller coaster. It uses LIM technology - Linear Induction Motors - to push you uphill. It's almost a magical feeling. You don't see what's pushing you! It's just a fun ride. It's going to be the most popular ride in Splashin' Safari this summer, I'm positive! 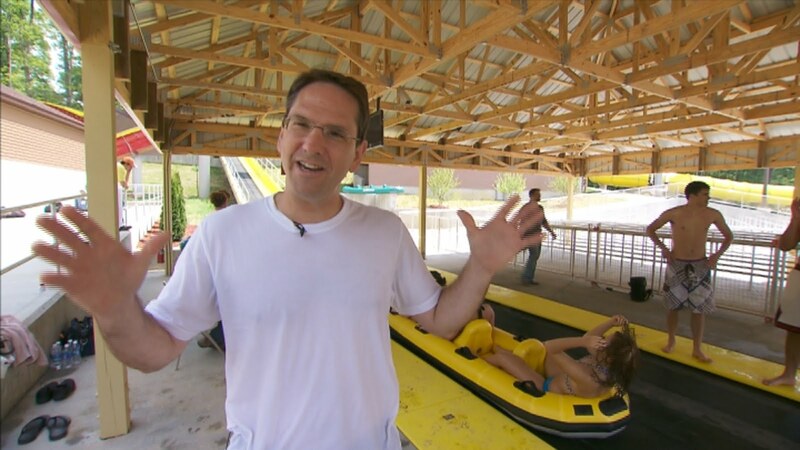 EB: Holiday World prides itself on being "Number One in Family Fun." You chose to spend $5.5 million dollars on this ride - a ride the whole family can enjoy - instead of a thrill ride that's essentially adults-only. 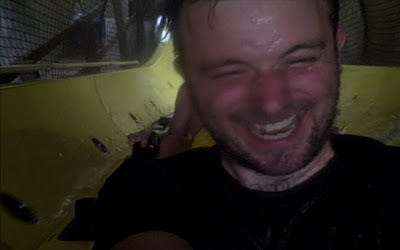 Will: Wildebeest is a family ride. We are commited. We are focused. Our whole reason for being here is to serve families better then other parks do. And by making the decision to spend $5.5 million on the Wildebeest I think we're reinforcing that commitment. We're all about families! And families are going to love this ride. EB: Can you break down the stats for me? 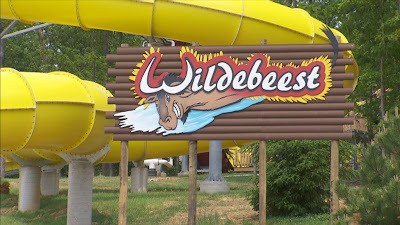 Will: The Wildebeest is the world's longest water coaster - it's a third of a mile, 1,700 feet long. Elevation change from the station to the top of the lift is about sixty feet. It's a two-and-a-half minute long ride, which is a long time for a ride. And we'll be able to put over 700 riders per hour on this ride. So we're going to move the line pretty quickly. EB: Compare Wildebeest to other water coasters out there - specifically the Master Blaster technology. Will: The Wildebeest uses a LIM technology to push boats uphill. It's Linear Induction Motors, which is a series of magnets basically. It's an electric motor that's unwound and it pushes the boats uphill. The other water coasters out there either use the Master Blaster technology: using water to push boats uphill. And that's a technology that's been around for a while and it works very well. But we like the LIM technology better because it gives us a little bit more speed over the tops of the hills and you get that feeling of air-time that you wouldn't get on a Master Blaster style ride. And there's also conveyor-belt style water coasters. But again, the LIM technology is the third generatino technology and it's just the best there is out there for water coasters. EB: Can you talk a bit about ride experience? Is the acceleration the same as on a Master Blaster water coaster? Will: When you're riding the ride and you feel the LIM there is a very definite acceleration. And it's a smooth acceleration - you start out slow at the bottom of the hill and as you get up to the top you reach a peak speed and then coast over the top of the hill. But the great thing is you get that feeling of air time going over the top of the hill, which is just a whole lot of fun. EB: Now, you're a fan of... well, rides. Will: Yeah! [laughs] Yes I am! EB: So tell me, how did you come to the conclusion to build this instead of another roller coaster? You know, you once told us that you would put more into the water park over the other park if you had to choose between the two. Are we going to keep seeing that? What about next year? Will: Um, well. [laughs] How do I answer that? [laughs] It's really important to us to find a balance with adding new attractions to Spalshin' Safari and to Holiday World. One of the things we really struggle with is - one of the things we really respond to is capacity issues. So we look at our rides. We look at where the back-ups are. Where the waits are longest. And we typically try to fit our new attractions to serve the needs that we see are not being met as well as we otherwise might. So at Splashin' Safari what we've noticed over the years is that the lines for Zinga, for Bakuli and ZOOMbabwe - our three biggest water slides - are actually some of the longest lines in the entire park. So, one of the reasons for teh Wildebeest is to address that problem. To provide another ride that will provide that same high thrill, real high energy experience in the water park and to provide what it is that the customers are looking for. Now, at Holiday World and Splashin' Safari, we're of course going to continue looking at developing both, but certainly Splashin' Safari's become a very important part of our mix. A lot of our customers come to us for Splashin' Safari, so Spashin' Safari is a big deal for us. After the interview, I was able to give the Wildebeest a couple of test runs - and get some great on-ride video (with permission, of course). Make sure you check that out on our Facebook page and listen to this week's show for my full review! Weekend Theater - Whale of a Tale! Live Trip Report - Disneyland! On Our Way to Orlando!